17 London fire stations are under threat. London Hazards has been commissioned by London Councils to work in all London boroughs to: Improve Health and safety in the workplace and communities through information, advice and training, focusing on women, black, Asian, minority ethnic communities and trade unions. 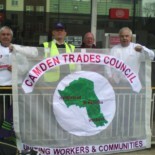 This entry was posted on November 12, 2012 by CAMDEN TRADES COUNCIL.